FEATURES/SPECS This elegant piano finish desk clock and pen set will be a welcome addition to any desk. 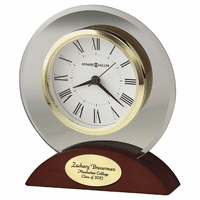 The quartz clock has a white dial with black roman numerals, black hour and minute hands and a gold seconds hand. It is bordered by a gold bezel, which coordinates with ballpoint pens and pen holders on either side. 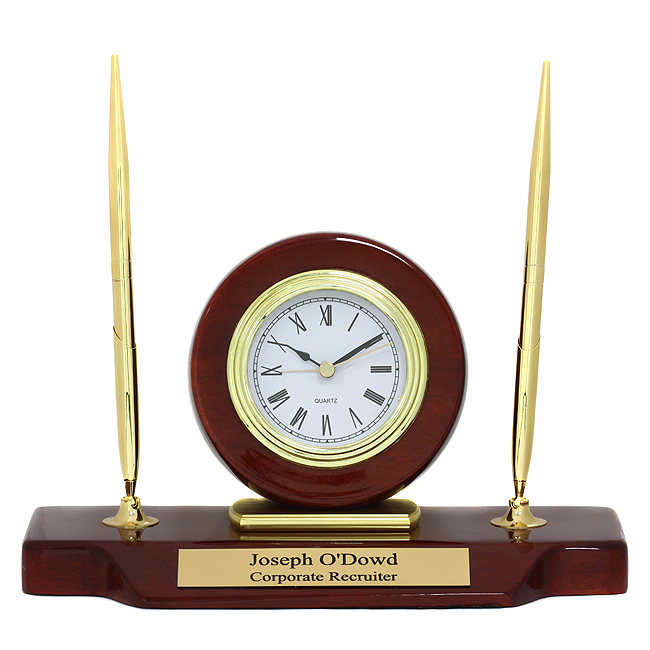 Add an engraved plaque to the front free of charge, making this engraved desk clock and pen set a unique, personalized gift for the executive in your life. 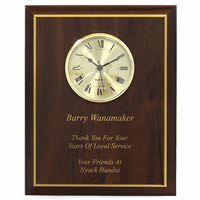 Dimensions: 5 3/4" x 9"
How quickly do items ship when they are personalized? This clock ships out the next business day, even with personalization. We ordered this item for a clerk who was moving on to another job. It was a very nice piece at a very fair price. The item came in with a typo error that was totally my fault, but customer service went above and beyond to make sure that a corrected plaque was produced and shipped out immediately. I can't express how grateful I am to have dealt with such good, old fashioned customer service . I purchased this clock set as a gift for my boss. He was absolutely thrilled when he opened it and has mentioned how much he loves it several times to me. Product as described. Very beautiful and very functional. ProsBeautiful, quick service, appears as described in ad. The item is nice, the engraving was perfect but one of the pens doe not work and it broke. How do I get it fix or return and get a new one? Merchant Response:We are so sorry about the pen. We have shipped a new, working pen out to you. ConsPens are not smooth. One of the pens broke. I will send you pics later. Unable to separate upper and lower parts of pen. Merchant Response:We're so sorry about that! We'd be happy to ship you new pens, would that work? Please email us with your order # or the last name on the order and let us know if you'd like us to.